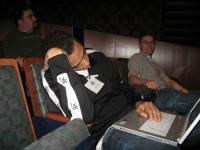 Was WordCamp Dallas 2008 Boring? No! Not at all! I had a blast this weekend. 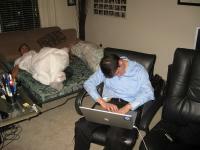 People fell asleep more because of partying the other night than the presentations. Or they fell asleep because the weekend was just exhausting, as you can see at the end of this post. I got to know so many nice and friendly people who sharing the same passion I have – Blogging! There were many great speakers on the podium, it was a joy and pleasure to listen to them. The first speaker at WordCamp Dallas 2008 was nobody less than Matt Mullenweg, the founder of WordPress. Right at the beginning it started with the announcement that WordPress 2.5 just launched 5 minutes ago. A cool start for WordCamp Dallas 2008, I would say. It was great to meet Matt in person and able to talk to him. He was open to all questions and critics and took his time to speak with everybody who liked to. After Matt’s presentation were many great and interesting speaker on the podium. Especially Liz Strauss – she was talking about how you have to interact with your audience. She had some really great suggestions and insightful tips how to interact with your readers. It was really impressive. I had read quite a lot about this topic and I thought I would know a lot about how to communicate with your readers. But she had some really fresh and new things to say I’ve never thought or heard about it. I also liked, that many things she said, doesn’t only apply to your blog and your readers, it also applies to your daily live and how you interact with other people at work or at home. It was really good and she is a very smart and absolutely nice person. Also John P. of onemansblog.com had a great presentation and the icing on the cake was his presentation of the new and impressive web-tracking & analysis tool woopra! It was just awesome, I was speechless when he showed some features of this program. I will talk more about it tomorrow. You have to see this. Besides all the presentations, panels and live podcast it was really cool to meet people you know online the first time in person. I also got to know many new blogger I subscribed to their blog this weekend. I’m really glad I met Lorelle vanFossen, a inspirational, high energy person you won’t meet every day. She is just a passionate WordPress blogger, a great asset to the WordPress community. Wonderful lady! It was also interesting to meet Nathan Rice, Jeff Chandler of jeffro2pt0.com the new diva of WordPress , Aaron Brazell of technosailor, Mark Ghosh of weblogtoolscollection.com, Phil of ptmoney.com, Jacob Santos, Mark Jaquith – Core WordPress Developer, Hector of geeksroom.com and Chris Jean. I hope I didn’t forget anybody. A huge thank you goes to Charles Stricklin of The WordPress Podcast and John Pozadzides of one man’s blog, the City of Frisco and all the sponsors. Without them it wouldn’t have been possible to attend to such a great event. And last but not least my two new friends and great guys Ronald Huereca and Ptah Dunbar. We had such a great time this weekend and a fabulous WordCamp Afterparty at my place. But the whole weekend was very exhausting for both. So they even fell asleep while they were uploading the newest pictures of WordCamp Dallas 2008 on flickr. I hope next time we will meet in Europe! Meeting you was a highlight of WordCamp. I only wish we’d gotten more time to talk. Lorelle seems to have gotten all of that. Glad she had a chance! Thanks for all of your help with every little thing at WordCamp. Do email me. I really do mean for our blog relationship to continue well into the future. You know a life-long friend when you meet one. It was a great weekend at Wordcamp Dallas! We will meet in Europe! maybe Milan? I think you just set a new world record for “number of pictures of a sleeping Ptah Dunbar in one blog post.” Was nice meeting you! *yawn* I’m still tired, too! Nice meeting you this past weekend. Best of luck on the transition to Europe. Go Mavs! Thank you all for your comments. The most impressive thing was, that it overwhelmed me how I was welcomed as a new kid on the block in an established community. I think I can say it for everyone who attended the first time at a WordCamp. No matter how big your blog is or how your expertise is, beginner or expert. Everybody was treated with the same respect and was welcome with open arms. That was the biggest thing for me. I hope I can make it to Milano or some other events. I saw your picture on your website. They look great. BTW, would it be ok to contact you directly. I have some bloggers and developers from Germany they had some additional questions or suggestions about implementing some features or improvements in WordPress. They would really appreciate that. It was nice meeting you too. I got your email and will get back to you today. Didn’t have a chance yet. And of course – Go Mavs! LMAO Ptah Dunbar got owned, just like I knew he would when that camera flash went off! Nice one Alex! Good thing no one took pictures of how tired I was at the Irish Pub or I would of been on the owned list! Nice meeting you Alex. So, you really enjoyed . I misssed it, but I have an great interest to join…but i didn’t ..
Can you please confirm me about one things that is their anybody you found that “who comes from Bangladesh or his/her origin is Bangladesh? Is the information is wrong or bugs? Can you make a screenshot and put it up on your website so I can see it? That would be interesting. It might be a bug then. But looks like someone busted you on the worst interview ever. I had to laugh about it and you responded very well to it. IMHO it wasn’t that bad my friend. Keep up the great work, will check out your website regularly from now on. Dude, I wasn’t sleeping… in that first picture I was just checking out this cool webpage, sideways. And in the second picture, I was totally looking at the ceiling. You must of caught me blinking.. pff. Bad bad photographer. Oh great, thanks hector for calling me out! lol I guess I can’t hide that fact I slept for a minute. But it was a power nap I swear! I wrote up my little WordCamp article, check it out Alex. yes, you are right, only was a minute and was a very powerful nap! And if you didn’t check out, there is a third picture you were sleeping. Hugging Ron’s camera while you had another power nap. Check it out, one of the last pictures in the flash gallery. Great article about WordCamp Dallas 2008. Very well written and enjoyable! 5 Things I Learned about Bloggers from WordCamp Dallas - Liz Strauss at Successful Blog - Thinking, writing, business ideas . . . You’re only a stranger once.